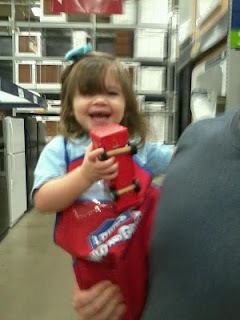 Homemaker Highlights: Lowe's build and grow and freebies! Lowe's build and grow and freebies! 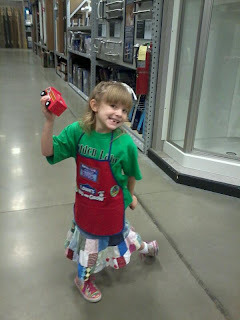 Barry and I took the girls to the Lowe's build and grow﻿ on Saturday. We try to go when ever they hold these clinics and the girls enjoy them so much. 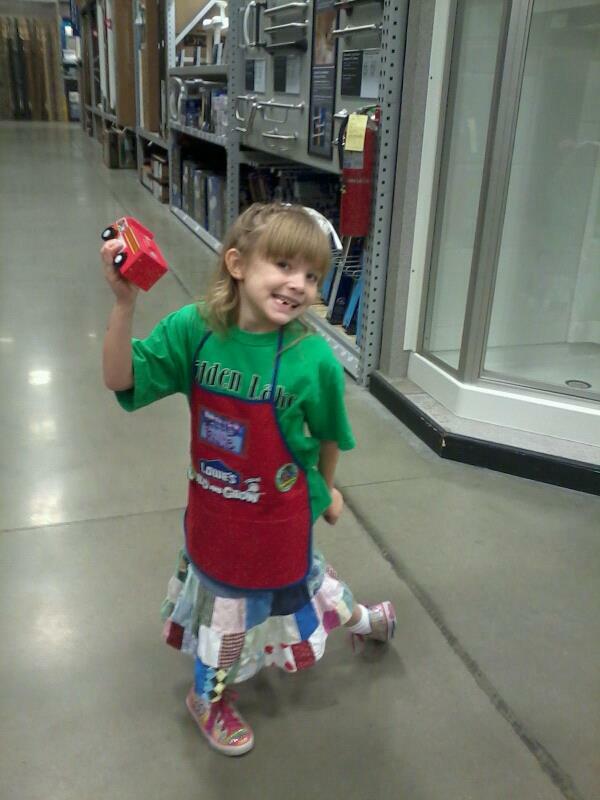 I think for Lilly-Rose it's a sense of pride to walk from the front door to the back of the store with that awesome apron...with her completed badges. She loves the looks and high fives she gets. I think for Emma-Kay she loves being around the older kids and doing what her big sister is doing. She also loves the finished product and playing with it. Lilly decided to pair up with Daddy and Emma was left with me ;) I'm usually pretty good at these kits, but that particular day I was juggling...a kit, Emma, being late...so not so great seats, and my Dad calling me constantly. With all of this I accidentally hammered the bottom of Emma's truck upside down and during the hammering process..my hammer head flew off and hit the wall. I guess I should praise the Lord for bad seats and no little ones hurt. As we started to finish up and put the wheels on..I noticed I had hammered the bottom of the truck upside down. Now this makes for an interesting situation on trying to figure out how to put the wheels on. So I'm glad my Dad kept calling, b/c I remembered some of his engineering. Growing up my Dad could fix about anything, but nothing was ever in the conventional way. He usually had some weird way to rig everything up..that kept you scratching your head..lol. So I took some left over nails and figured out a way to keep the wheels on. The great thing is...it still rolled :) Meanwhile, Barry put the back wheels on the front...so Lilly's CV joints was coming off her truck..lol. I didn't feel so bad then. Bottom line...Lowe's is AWESOME for offering these clinics. The kids and parents get so much out of it. The time you spend together laughing and making memories is priceless. 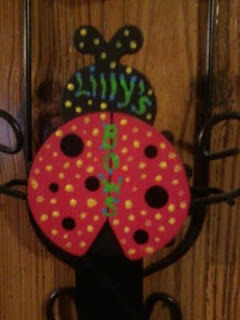 The pride that goes into making something of your own and showing it off..also priceless. The girls got to see both set of grandparents afterwards and show off their cool toys. So don't miss out on the 8th for a Monster machine! Also...remember..it's FREE! So very family frugal. Download FREE pumpkin stenscils http://www.bhg.com/bhg/file.jsp?item=/marketing/registration/Charity_Pumpkin_Stencils/bhg_splash_charitypumpkinstencils_bigbrothersbigsisters&temp=yes%20&ordersrc=rdbhg1102221 For every stensil downloaded...Better homes and Gardens will donate 2.00 to Big Brothers Big Sisters. FREE sample of Peppop energy http://peppod.com/sample/ It says you will receive a confirmation email when your sample has been mailed. FREE sample of vitamin gummies https://secure.startsampling.com/sm/vitamins101953/captureAddress.iphtml?item=101953&source= Allow eight weeks for delivery. Wow on the hammer head I am glad no one got hit with it you would think they would check the tools before handing them out with little ones. Looks like ya'll had a blast though..